Artificiell Intelligens – Den sista uppfinningen? (the last invention) is the title of the upcoming event at Bildningsbaren, Malmö University’s after work lecture series at Grand. 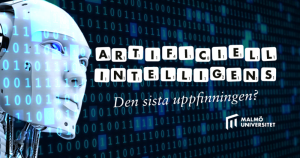 On September 26, Faculty Dean Andreas Jacobsson will be one three guests invited to share their thoughts and insights on the hot topic of AI. The discussion will be held in Swedish. What is AI and how does it work? What will the consequences be when we share our intellectual abilities with machines? Who controls AI-development? What are the opportunities and the challenges with AI? Could AI lead to the end of humankind? These are some of the questions to be discussed. The conversation is followed by a mingle. As usual, the event will be broadcasted live on Bildningsbaren’s Facebook page. Read more (in Swedish) about the topic for the upcoming Bildningsbaren. This entry was posted in TS by DanielHarju. Bookmark the permalink.